​Our Victorian ancestors left us a marvellous collection of photographs and postcards showing the people and the world they lived in. But they have a serious flaw. Most are posed photos, people looking stiff in their Sunday best clothes and children almost unnatural in starched collars. ​Others show photos for posterity of men going to war or teams of sports people trying to look serious. ​The picture above shows an isolated historic field barn in the By Brook Valley viewed from the junction of a public footpath with a bridleway. Located in the neighbouring Parish of Colerne but also seen from within the Parish of Box which forms the landscape back drop to the picture. In many senses photographs aren't real. They capture a moment in time but rarely show action, intent or even an insight into the thoughts of the people depicted. They give an image without the same emotion depicted in the great painting masterpieces. The paintings made by new Cotswold Warden, Varian Tye, offer an alternative insight into the character and work being undertaken in Box Parish and the surrounding areas which also lie within the Cotswold Area Of Outstanding Natural Beauty. ​are discouraged under the Chalk Hill Management Plan. ​Pride and commitment in preserving our environment are shown in the clearing of Box Hill Common. The Cotswolds Wardens and the Conservation Board were founded in 2004 to conserve and enhance the natural beauty of the Cotswolds Area of Outstanding Natural Beauty. The intention was to maintain the landscape surrounding our village whilst fostering the social and economic well-being of local communities. ​Below: View over the By Brook Valley in the adjoining Parish of Bathford showing the historic farmhouse, barn, granary, stables and shelters sheds of Lower Shockerwick Farm. All the buildings are listed Grade II because of their special architectural or historic interest. 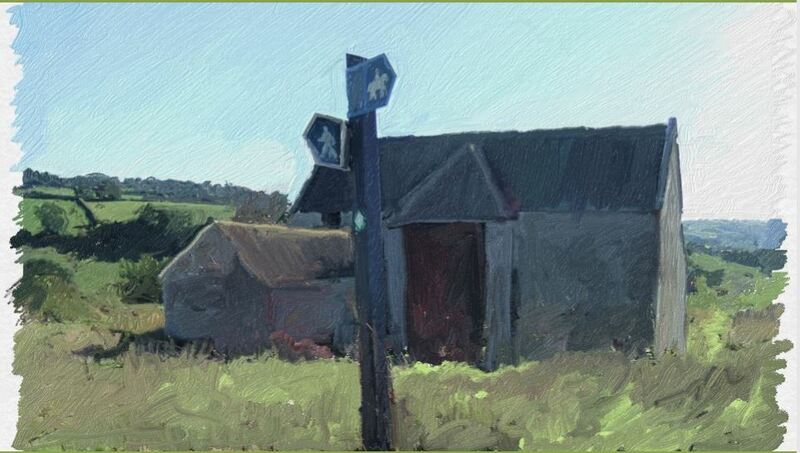 The painting depicts the views on a Box NATS History Trail to Shockerwick and the western boundary of the Box valley. Who could argue that the wardens aren't doing a wonderful job? Our landscape is constantly evolving with changes in social custom and farming methods. Until the twentieth century, experts were employed to produce wood on a commercial and sustainable basis with pollarding and other methods of regular harvesting. Trees were identified for use as building timbers, domestic tools or for basket weaving and were encouraged to produce over decades of management. Even in recent times, many of the woodlands we enjoy had different uses. The beech tree landscape in Quarry Woods (pictured below) emerged in the twentieth century when quarry activity ceased, the open mine shafts subsided and woodland overtook the area. Now it is an area of beauty to be cherished. Quarry Wood as seen from one of the public rights of way within the wood. Maintenance of this woodland requires a lot of manual labour where the machinery can't enter and the undergrowth has stifled the natural growth that the wardens seek to promote. Above: Coppicing at Colerne Park Woods to provide timber rods for laying of new hedges. Below: Works of clearance with a strimmer near Prospect Stile on the Cotswolds Way in Bath. Kelston Round Hill, an ancient barrow , can be seen in the distance. If you think that Varian's paintings have a curious realism, they are digitally based, a modern version of painting with the computer used to help change a photograph into a painting.